PhilBoxing.com >> News >> List of Articles >> Ed de la Vega, DDS: De La Vega: Palicte wins but is a rematch with Nietes the way to go? De La Vega: Palicte wins but is a rematch with Nietes the way to go? Tonight at a remote casino in Alpine, California not too far from the city of San Diego, Aston Palicte made short work of his overhyped opponent from Puerto Rico, Jose Martinez. The Puerto Rican barely lasted 5 minutes with Palicte, and for a guy who is supposedly undefeated, that is a crying shame. The best that Martinez can do to Palicte was inflict a cut via an accidental headbutt towards the end of round one. Luckily, the cut was not too serious that it only took trainer Rodel Mayol to control it. Had it been more serious, it could have been another story. Palicte’s win now earns him a re-match with WBO champion Donnie Nietes. 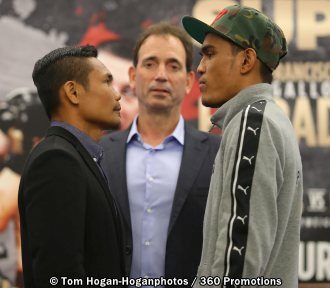 Palicte and Nietes fought to a controversial split draw in Los Angeles not too long ago, a fight many pundits feel prevented Nietes from winning his fourth division title then. Nietes however made up for it by beating Kasuto Ioka of Japan last New Year’s eve at Macau. With Palicte winning, he again becomes a mandatory challenger to Nietes’ WBO belt. Frankly, I admire Palicte and Nietes. But, from my point of view, Palicte should explore other ways to earn his title. Perhaps then he will have a better chance to win and add another Filipino world champion in the world’s boxing list of champion. Nietes in my humble opinion should now be exploring big money fights versus bigger names (no offense to Palicte) like Sor Rungvisai and Estrada. But if Roy Jones who handles Palicte can come up with the same amount of money, why not a rematch? If the money is not right, Nietes has nothing to gain fighting Palicte again. It does not make a great business sense. Afterall, as Bob Arum said, in the hurt business like boxing “it's all about the Benjamins”.